This short homecoming dress by PromGirl gets beautiful style from the delightfully classic features. Embroidery along the high-neck bodice of this short hoco dress sets the tone for a soft and traditional look, while a light chiffon skirt gives an extra touch of grace. Making this little party dress ideal for many different venues, the sleeveless bodice is fashioned from illusion mesh to provide sheer coverage above the sweetheart-shaped lining. Coordinating vintage-style embroidery and sparkling accents decorate the sheer overlay on the bodice adding to the appeal and creating an eye-catching look to the short mocha dress. 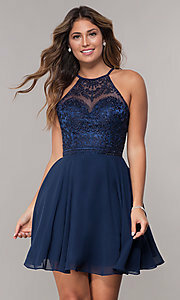 A stone-embellished waistband accentuates the figure below these fabulous details, and the above-the-knee chiffon skirt beautifully completes this homecoming party dress. The model wearing mocha is 5'7".